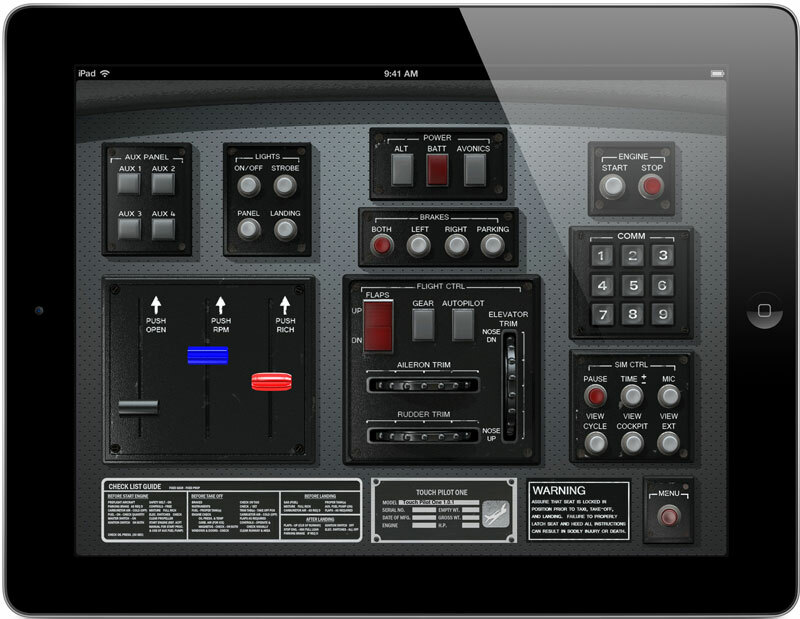 Touch Pilot OneTM allows you to control a flight simulator from your tablet. Use the on-screen controls to adjust your throttle, gear, flaps, and more with just a touch. Now you don’t have to remember all those keyboard commands! It transmits commands over WiFi, and works with any flight simulator running on a Windows PC. The app is available now for iPad and Android tablets. Get it on Apple’s AppStore, Google Play, the Amazon Appstore, and Barnes & Noble. Modern flight simulators are highly complex, just like the aircraft they seek to simulate. There are too many controls for one joystick to cover. Most sims use the PC’s keyboard for the rest of the controls. In the past, pilots faced the cumbersome task of memorizing dozens of keyboard commands, which are different for each sim. Those days are over with Touch Pilot One. Now, you can touch realistic looking aircraft controls on your tablet’s screen instead. The controls are clearly labeled, conveniently illuminated, and a joy to use compared to a clackety old keyboard. You’ll be even more deeply immersed in the feeling of flying a real aircraft! Touch Pilot One works by emulating a joystick on your PC. We use a virtual joystick driver, so the flight simulator sees Touch Pilot One as just another joystick on your system. This is what allows the app to work with any flight simulator. There are 45 controls, including three sliders, three trim wheels, and a 9 button number pad. You can map any control on the tablet to any function in your flight simulator. For instance, you could use the black slider for throttle, or you could use it for radiator, carb heat, spoilers, or any other function that you could map a joystick axis to. You have four auxiliary buttons that can be mapped to anything you like, but you can also map any labeled button to something other than it’s label suggests. Touch Pilot One is very flexible, because it basically is a joystick. Every button in Touch Pilot One is a joystick button, with two exceptions. The number pad buttons send the actual keyboard keys, 1 through 9, to the sim. The mic button sends the back-tick (`) key. This is the default mapping for the ATC window in Microsoft Flight Simulator X. Why did we do this? 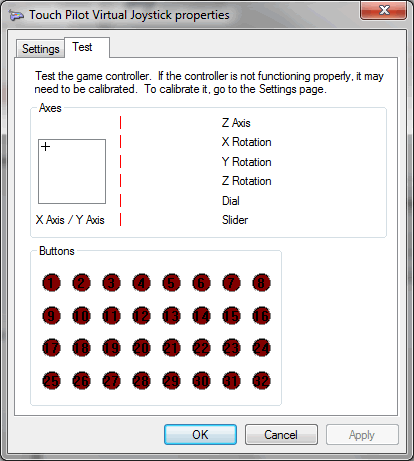 Because joysticks have a limit of 32 buttons in Windows, and we really wanted to include more buttons than that, so we made some of them send keystrokes instead. You can still use these buttons for whatever you want, as long as your flight sim allows you to map those keys. Touch Pilot One requires Touch Pilot Server to be running on the same PC as your flight simulator. Download Touch Pilot Server for free, and follow the instructions.